A hot cup of coffee or soothing tea only is as good as the mug you drink it from. To get the full taste and experience of your morning or evening beverage, you need a cup that is both well-made and durable. With Klikel's 16oz Coffee Mugs, you will make your drinking experience a completely satisfying one - anytime, anywhere! dont overlook one of the most important parts about your morning coffee or afternoon tea - the mug you drink it from. Many mugs are made from material that alters the quality of the contents to completely ruin your drinking experience. Plastic and metal mugs often leave behind particles of their composition into the drink to alter the taste and properties leaving you with a unsatisfying drinking experience. Our solid mugs are made with porcelain that is guaranteed to leave your cup of whatever as great tasting and delightful as you expect it to be. they are thick and the handle fits effortlessly in your hand for a comfortable sipping. Keep them at home and serve a nice round of tea to your lovely guests or get a set for your work office so your coworkers can stay awake with an afternoon coffee break. Whatever your needs may be, our mugs are here to give you the absolute beverage experience! Whether Its a hot or cold one, a refreshing beverage is something everyone can agree makes our days a little better. Give the gift of the perfect quality beverage to a friend or family member and make their days a little brighter! Whether Its for a house warming, wedding, birthday, or holiday event, these mugs make for a great gift that will surely spark a smile in anyone's face. Practical, efficient, and high-quality - what more could anyone ask for? GREAT QUALITY MUGS: Drink your morning coffee or evening tea in a large, pretty mug with a comfortable handle designed for easy sipping. 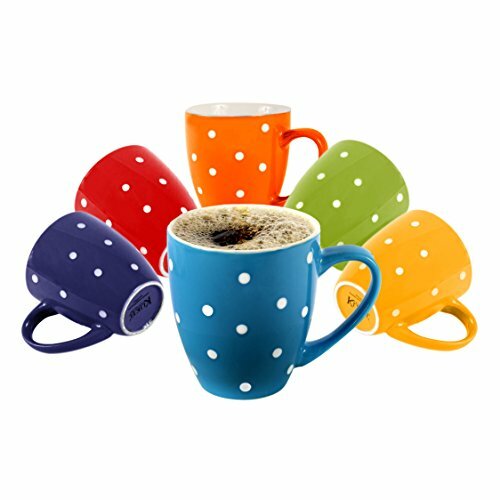 LOVELY DESIGN: Enjoy 6 beautiful colors, including red, orange, yellow, purple, green and blue with white polka dots to brighten your home. DURABLE PORCELAIN: These premium quality tea and coffee mugs are impact resistant, designed to withstand rough use, including stacking. MICROWAVE AND DISHWASHER SAFE: Toss in the dish washer for quick cleaning. They can be heated or cooled in the microwave or freezer. A WONDERFUL GIFT: This crockery set makes the perfect housewarming or holiday present, or perhaps a newlywed wedding registry gift. If you have any questions about this product by Klikel, contact us by completing and submitting the form below. If you are looking for a specif part number, please include it with your message.